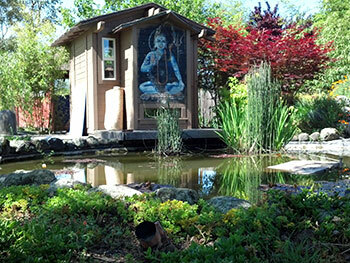 ﻿ Sonoma Ashram, an ashram in California for personal retreats, yoga and meditation. Ashram residents maintain a regular schedule of daily practice which includes meditation, yoga and seva (selfless service). Noble silence is observed early morning to 8:00 am each day. Special Navaratri daily schedule: morning puja 8:00 - 9:00 am and evening puja 7:00 - 8:00 pm. During these days, group meditations, satsangs and classes will not be held. The regular daily schedule resumes April 6. Yoga: In the yoga classes at Sonoma Ashram, you will develop greater physical and emotional flexibility and a deeper awareness of your inner spiritual potential. With an ongoing practice, you will experience greater peace and equanimity. The classes combine slow and gentle yoga flows with sustained poses, interspersed with brief rest periods and contemplative practices. All aspects of traditional Hatha Yoga, including postures, pranayama (breathing techniques), relaxation, and meditation are addressed in order to provide a complete and fulfilling yoga practice. Our yoga teachers are fully trained and certified yoga instructors, and initiates of Babaji. Marilyn Knight-Mendelson has been practicing yoga since 1974 when she was living in India, and over time has immersed herself in various styles, notably Iyengar and Raja Yoga. For the past ten years, she has taught at her Napa studio and also at Sonoma Ashram. In her classes, Marilyn guides students towards greater physical and emotional flexibility and a deeper awareness of inner potential by combining slow asana flows with sustained poses interspersed with brief rest periods and contemplative practices. Marilyn addresses all aspects of traditional Hatha Yoga, including asanas, pranayam and meditation, to provide a complete and fulfilling yoga experience. Marilyn holds certifications through Yoga Alliance (RYT - 200) and the Mindful Yoga Therapy Center (teaching yoga to trauma victims). She studied Iyengar Yoga with Noelle Perez Christiaens at the “Institut de L’Aplomb” in Paris in 1978 and also received certification in yoga principles and instruction from Edoardo Beato from the Kailas School of Yoga in Padua, Italy. A long time student of Babaji, she has received his blessing to teach yoga, meditation and certain Hindi spiritual texts. Joanna Brown is a Registered Physical Therapist who has studied myofascial release, cranio-sacral therapy, and yoga and meditation for over thirty years. She completed her RYT 200 hour training with Lisa Murray in 2014. She has studied Raja Yoga with Michele Herbert and Mehrad Nazari as well as Swami Veda of Rishikesh, India. She was initiated by Babaji and has been a member of the Ashram since 2014. Joanna’s yoga classes combine slow asana flows with emphasis on combining breath with movement. She offers variations based on class ability. Her classes create a safe place to explore your limitations and create space where you may feel stuck. Nitya Rose has been a yoga practitioner for over forty years. She is certificated in basic and advanced yoga, accessible and adaptive yoga, Yoga for the Special Child and Yin Yoga. Nitya has been a long-time member of the Sonoma Ashram Sangha and has studied Aghor yoga with Eduardo Beato. She teaches gentle yoga classes that are suitable for everyone, from new students to individuals with long-standing practices, as well as those with special needs. Adam G Lovelace is an ashram resident. He completed his 200 hour Hatha Yoga teacher training with Rishikesh Yog Peeth in India in 2009. His classes are gentle, centered on the breath, and focused on the internal landscape. Adam is inspired about the ashram’s focus of self-care for 2018.